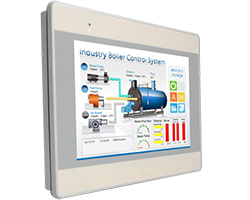 4400 Series touchscreens are available in a variety of configurations, including NEMA4/IP65 rated front panels and memory capacities to 256MB, in screen sizes up to 10.4 inches. For more detailed information, consult the individual specifications linked below. EasyBuilder is the software used to build displays on Model 4400 touchscreens. Available as a free download at right. Model numbers ending in NE have no Ethernet.